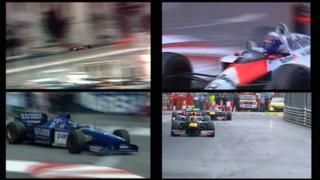 Watch a split-screen view of the final laps from the Monaco Grands Prix of 1981, 1988, 1996 and 2012. The footage shows how the Monte Carlo track has barely changed over the years, with the 3.34km street circuit on the French Riviera preparing to host its 62nd race in 2015. Click here for BBC coverage details of the 2015 Monaco Grand Prix.